The Japanese enjoy one of the longest life spans in the world -- in part because a traditional diet is comprised of fresh, unprocessed foods. In addition to eating healthfully, the Japanese also have different attitudes toward food than many Americans. In Okinawa, for instance, residents practice "hara hachi bu" or eight parts of 10: They stop eating when they are 80 percent full. Experiment with Japanese recipes in your own kitchen and adopt smaller portion sizes for a healthier diet. The Japanese use the same word, "gohan," to mean cooked rice and meal. Prefixes are attached to gohan to form words for breakfast, lunch and dinner: asagohan, hirugohan and bangohan. In other words, a meal without rice is not a meal at all. Cooked white rice is low-calorie, low-fat and surprisingly high in protein with more than 4 grams per cup. White rice is also an excellent source of folate -- a nutrient that helps to prevent birth defects. Brown rice has more protein than white rice and is a good source of heart-healthy fiber. Rice is Japan's primary carbohydrate, and fish is the protein of choice. The average Japanese consumes 154 pounds of fish per year, or 1/2 pound per day, according to the Weston A. Price Foundation. Fish, including tuna, trout, salmon and shrimp, is eaten baked, raw, dried or pickled. One cold and one hot seafood dish are usually served at each meal. Seafood is an excellent source of nutrients including vitamins A and D, omega-3 fatty acids, phosphorus and selenium. However, fish is susceptible to mercury contamination, which is a serious risk to human health. The types of fish highest in mercury include yellowfin and canned albacore tuna, grouper, sea bass and mackerel. Soybeans aren't a staple, but they do find their way into many Japanese dishes, as practically every dish, sauce and marinade contains fermented soy sauce as a flavoring. Additionally, tofu, which is made from soy, is eaten in dishes such as miso and natto. Plain tofu is very high in protein and low in calories. A slice of firm tofu has just over 50 calories and 5.8 grams of protein. The Japanese take pride in eating a diverse and nourishing diet. Schoolchildren are encouraged to eat at least 30 foods per day, according to the Weston A. Price Foundation. Fresh fruits and vegetables including mushrooms, bamboo shoots, mango and watercress are readily available at markets and contribute to a varied diet. 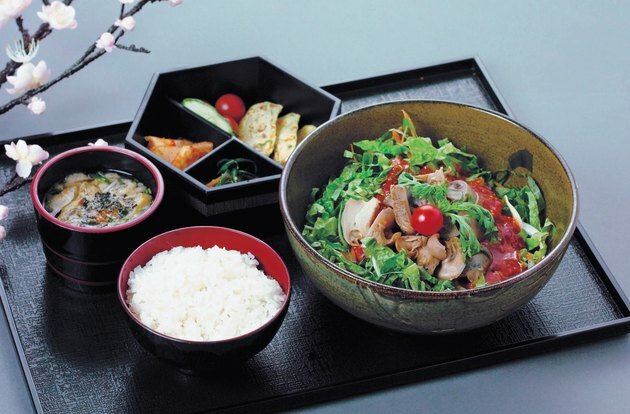 The traditional Japanese seafood and vegetable-based diet has succumbed to so-called diet Westernization in many regions, according to the United Nations University. Of Eastern countries, Japan has experienced the most dramatic nutritional shift due to economic factors, urbanization and an increase in food availability. For instance, residents of the capital of Japan are eating 90 grams of meat compared to the 5-gram-per-day average in 1947. For the first time in Japanese history, residents of Tokyo are consuming more meat than seafood. The Westernization of the Japanese diet not only has negative consequences for the health of the nation, but also poses serious environmental and economic problems.